Posted on 7/19/2017 by Kent Bettisworth. 0 Comments. 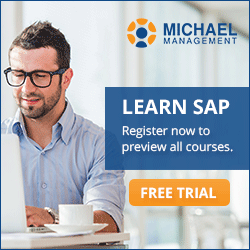 As an SAP professional in Financials & Controlling, you may need to know this information. Changes in laws and rules will affect how you do your job, report on leases and manage off-balance sheet entries. In addition to our SAP training, we want to keep you up to date on these important changes. The current off-balance sheet accounting has been criticized for years. Now, accounting boards have decided on a new standard effective in 2019 internationally and in the US. This informative webinar is presented by Kent Bettisworth of Bettisworth & Associates, Inc. Kent has over thirty-five years’ experience creating new organizations, implementing and managing information systems including SAP, and creating and delivering business training programs including SAP. Currently he is focused on evaluating and implementing solutions for the new Revenue Recognition and Lease Accounting standards. Lease accounting is a topic that has been discussed for many years between the international accounting boards and the US boards. Trillions of dollars in capital and operating lease assets will be added to balance sheets as right-to-use (ROU) assets starting with 2019 or earlier. What should my company do to prepare? Tips for early assessment including review of classification changes, review of existing leases for classification changes, estimates of the financial effect of the change and a review of the candidates for process improvement opportunities. Comment below and let us know if you have started making organizational changes to get ready for 2019?